The first one is Japan’s World No.2 player Akane Yamaguchi. Although she is only 1.56 meters tall, she has already won several major tournaments with her delicate skills and also has reached number one in the world ranking last year. The 21-year-old has won the bronze medals of All England Open Badminton Championships, World Championships and Asian Games this year. 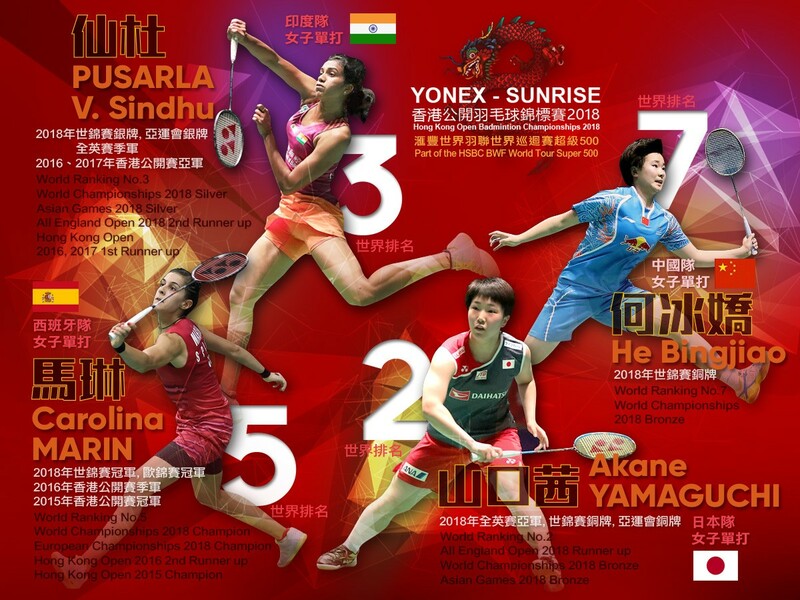 Pusarla Venkata Sindhu of India is World No.3 player. Although her parents were volleyball players, she chose to be professional badminton player. She was the silver medalist of Hong Kong Open in 2016 and 2017. This year, her performance is even better. She won silver medals in World Championships and Asian Games and a bronze in All England Open. Carolina Marín, spanish player currently ranked No.5, is a well-known name among Hong Kong fans. The Former World No.1 has captured Hong Kong Open’s Women’s Singles gold in 2015. Although her world ranking has dropped, she is still in good form. She has won the World Championships and European Championship this year. Fans are expecting some fierce games from her in Hong Kong Open. The last player is He Bing Jiao of China. She is one of the World top 10 player in China Team besides Chen Yu Fei. The 21-year-old has won a bronze medal in World Championships this year and is the rising star of the team.